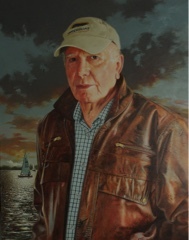 Last Thursday we needed to be in London to take this oil painting for final selection (I hope) by the National Portrait Gallery for its prestigious BP Portrait Award. As I mentioned in my last blog, only 400 paintings have been selected out of nearly 4,000 entries from all over the world, for the final selection of only about 35 to form the exhibition. We needed to get the painting to the reception location somewhere on the other side of London by 8 pm that evening. So giving ourselves plenty of time to reach the venue we left Henley at 5 pm. Normally the journey would take just over an hour. But we must have chosen the worst time of all to make the journey. The satnav told us that the M25 (our favoured route) had a considerable delay, so rather than be stuck on the motorway for ever we opted to drive through the centre of London. What with the cyclists and motorbikes weaving in and out - mostly without lights - and the endless roadworks, deviations and traffic lights, I really thought we'd never make it in time. When we were about 5 miles away from our destination the satnav said we would arrive at about 7.50. But we made it - just. Barely visible on various walls on dark buildings were small placards directing us to the handing-in site. In a cold, bare warehouse three warmly dressed youngsters were there to take the paintings. It was five minutes to eight. Our journey had taken three hours of very difficult driving for my heroic young friend. Having no idea in London where we were, as we came out of the building this was the view spread out in front of us. 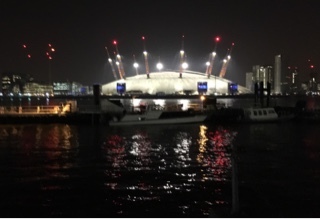 The Dome - site of the O2 stadium and the opening sequence of the 1999 Bond film 'The World is not Enough'. Now I just need everyone to cross their fingers that my painting might hang in the National Portrait Gallery. I've very nearly finished the sculpture head of my 10 year old great niece Kate. It's at the final bronzing stage and by next week I'll be spending hours blacking, rubbing and polishing to achieve the final tone I'm aiming for. 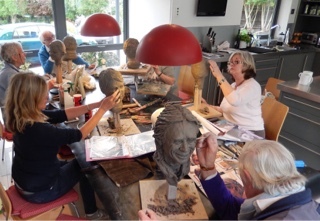 Shirley Collen, our sculpture teacher, has been holding two open days recently for the village. Here are some of our class hard at work. I'm at the far end. 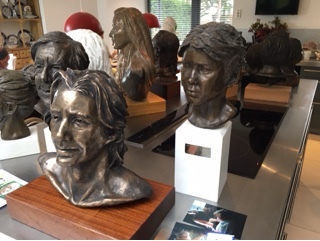 Here are some of the heads on display for the open days - many just first works by the students. I've finally finished the big oil painting of the sweep and his black cat and will post it on my blog when it's varnished. 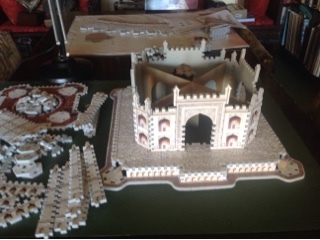 That will be in a few weeks time after allowing it to dry. 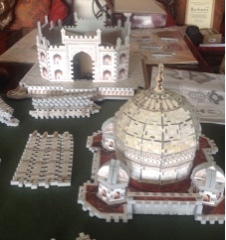 Compare the size ( forty by thirty-five inches ) to my latest, and smallest miniature. 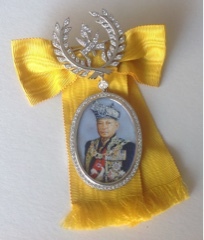 It measures less than one inch high and is encased in diamonds and gold. Soon it will be worn by a Malaysian Sultana. We've been to three films in the last three weeks. My verdict - 'Dad's Army' - amusing in parts, good cast, but not as well scripted or as good as the television original. 'The Big Short' - very good and tremendously fast moving but I needed to know a lot more about the money markets to really know what was going on. Finally 'Hail Caesar' A big disappointment. Unfunny and a lot of wasted talent I thought. It's now Sunday afternoon and the sun is out at last. My young friend has just mowed her lawn and is now doing a bit of tidying up and probably pruning. 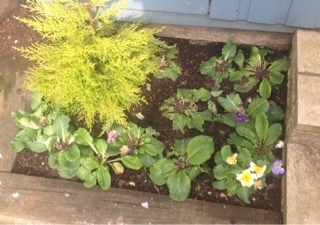 I planted about thirty highly coloured polyanthus in my little plot in her garden last week and have found that all the flowers have been eaten. I rang Colin, the gardening expert on BBC Berkshire this morning and he thinks pigeons may be the culprits because the flower bed is right under the bird feeder. It may be mice, however, as the paper MYF wrapped the begonia corms in had shown signs of nibbling round the edges. To end this blog on a very sad note. 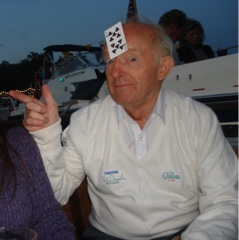 My friend Paul Daniels died early on Thursday morning. Debbie was with him until the end. She's being incredibly brave. For many years they've been an amazing love match. Paul, world famous and incredible magician, was one of the kindest men I've known. If ever I wanted to know something technical he always knew the answer. Ever the funster he made everyone laugh. Goodbye Paul, it's been wonderful to have known you. Here he is on my boat last summer pointing at my young friend who couldn't figure out where her card had gone to. ( She was busy looking at his hands).